Soldiers, who would not say if they were Russian or Ukrainian, patrol outside the Simferopol International Airport on February 28, 2014. Vladimir Putin is becoming more deeply entangled in Ukraine, though it’s unclear if he’s being pulled into the crisis or helping to orchestrate it. After nearly a week on the run, on Tuesday, Ukraine’s fugitive president was spotted in a five-star hotel, and then a Kremlin country retreat near Moscow. On Thursday, Viktor Yanukovych issued a statement declaring himself the only legitimate leader of Ukraine, and asking Russia to “ensure my personal safety from extremists.” While Putin and Yanukovych do not have a good relationship and Russia state TV has portrayed him as a coward, it appears that Russia is providing him with tacit support. The situation in Ukraine became even more complicated as demonstrators in the autonomous region of Crimea voiced their opposition to the new pro-Western government in Kiev, and suggested they might secede. Most people in Crimea are ethnic Russians, and on Thursday, pro-Russian demonstrators took to the streets in Simferopol, the region’s capital. Armed militants seized government buildings, and police officers did little to stop them. Legislators who made it past the protesters said they’ll hold a referendum in May to decide whether to “grant the autonomous republic the status of a state.” They also replaced the Kiev-appointed regional administrator with the leader of the Russian Unity party. 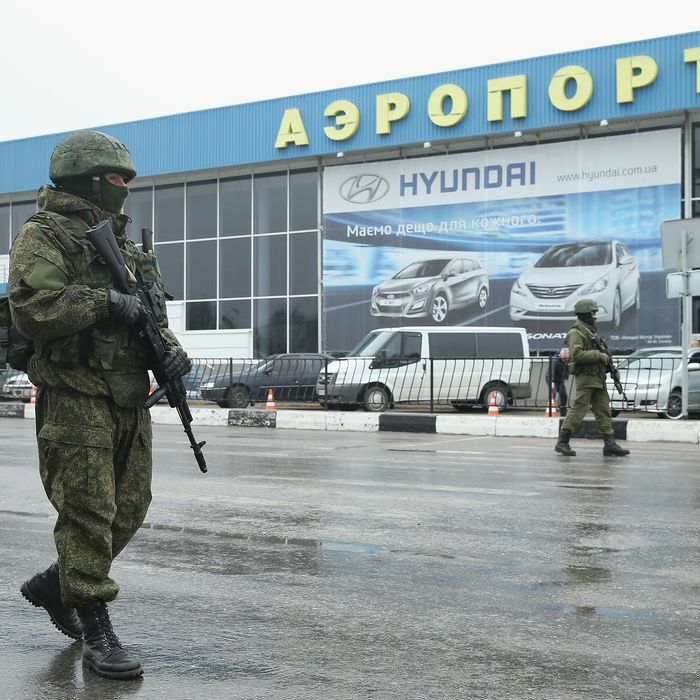 Early on Friday, unidentified men in military uniforms took control of two airports in Simferopol. No violence was reported and the airports appear to be open. Russia has refused to comment, but Ukraine’s new Interior Minister Arsen Avakov claimed in a Facebook post that the men are part of the Russian navy. “I can only describe this as a military invasion and occupation,” Avakov said.